Many organizations like libraries, schools and museums are interested in setting up Fab Lab spaces but aren’t sure how to do this – especially if they do not have sufficient resources to deploy large-scale or specialized workshop facilities. The CU Community Fab Lab has pioneered a model based on the ideological and tool capacities of the main MIT network specification, but with several key differences. Low Cost. The assemblage we suggest below requires less than $10,000 of equipment to implement, not including computers. Machines are more broadly available and cost less to replace or maintain. Mobile. We emphasize tools that can be easily moved around between locations in regular-size vehicles so workshops and activities can be setup on a short-term and short-notice basis. Scalable. Nearly every work area we have selected can easily be expanded at a low cost to include over a dozen simultaneous participants or more specialized forms of fabrication. Education-Oriented. Rather than baffling participants by daring them to make anything they can imagine we prefer to focus on the meaning of making and the learning that happens through creation. Both process and product are important when guiding and channeling imagination. Often creativity can be actively encouraged by imposing constraints and inspiring learners with rewarding and relevant starter projects. Community-Focus. While the MIT Fab Academy is an exemplary way to connect to other Fab Labs and learn powerful fabrication methods it doesn’t help organizations to understand the social, cultural and educational components of supporting a Fab Lab that serves audiences like youth and first-time makers. Our guidance is based on six years of experience operating as a community fab lab and has expanded into numerous grants and implementations. It has been built with assistance from the Museum of Science and Industry Fab Lab in Chicago and Makerspace Urbana. We believe our model complements the MIT methodology and also supplies more structure and digital fabrication emphasis than similar Makerspace startup implementations. It is an easy pathway to more formal participation in the MIT Fab Lab network and tool system. Watch the video below, or download the original presentation to skip around. Most spaces of formal and informal technology education have a computer lab available for participants, so we didn’t include one in budget for the equipment list here. Desktops usually provide the best usability, power-per-dollar and last longer, but obviously cannot be moved easily. You will not need super powerful computers for most of the tools below but do avoid Chromebooks – computers with OSX or Windows are a requirement if you plan to install drivers for tools. SSD’s are suggested as the most noticeable speed upgrade. Try to avoid computers with bottom-of-the-barrel budget processors like the Intel Atom, as these machines will not be able to effectively multi-task or handle complex vector graphics. Cost: Computers, especially laptops, can be pretty expensive. One way to deal with this is to invest in durable used business equipment. 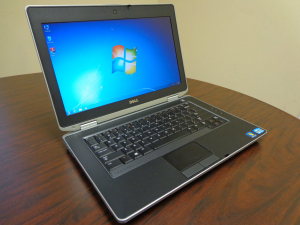 For instance we’ve had good luck with Dell e6430 laptops (2012) with workstation nVidia graphics, which can be found on Ebay for just over $200. Our recent (2017) laptop lab is made up of refurbished Acer E5-575G laptops with 7th generation Core i5 processors and nVidia 940MX chips, purchased for under $500 each. Suggested Software: Take a look at our computer lab specifications to get an idea of powerful open source and professional propriety software – we think Inkscape is essential! Materials/Parts: Having a disk-cloning station is very handy for making rapid updates possible; just update one computer and copy it to all of the others – then keep all of your important files on a cloud account or local server. Alternatives: Organizations with particularly savvy geeks may be able to use monitor-mounted Raspberry Pi‘s with Linux in place of more powerful machines, but these will not be able to drive tools. If you have extraordinary sums of money Apple iMacs are accessible, powerful and relatively easy to move around. 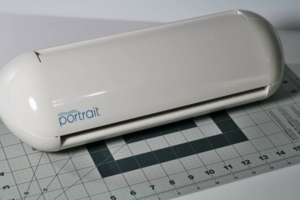 The Silhouette Portrait is a small extra-ordinarily affordable, safe and durable cutting machine, kind of like a computer-controlled exacto blade. Of all of the equipment we’ve owned at the lab over the years we’ve never had one break. They can cut paper, adhesive vinyl, fabric and copper tape for circuits and are easy enough to use that even grade-school kids can work them. They help learners think about and work with basic graphic design and layout concepts such as layers and shape. Cost: Typically around $130 on Amazon but can be found used on Ebay for less than $100. Suggested Software: Silhouette Studio is free, and works well for most design needs. It is useful to have at least one copy of Silhouette Studio Designer Edition ($50) because it can directly import SVG (vector) files. Materials/Parts: The real cost of the Silhouette is cutting mats ($10), which tend to be destroyed quickly by children who drop them on the floor (loss of stickiness) or lose them. Blades will periodically need to be replaced ($8). We’ve had good luck purchasing matte adhesive vinyl in bulk from http://www.signwarehouse.com. Alternatives: There are many other kinds of electronic cutters – if you decide to go with another brand make sure the software supports importing of user-designed images and vector-format images! Comparable low-cost cutters (like the Cricut!) usually do not. There is a larger version of the Portrait, known as the Cameo, that is nearly identically except that it is a little bit larger and supports longer cutting mats. It is equally reliable. One of the most exciting areas of digital manufacturing that we’ve encountered is e-textiles. Graphics can be designed on computers for all kinds of mediums, and fabric is no exception. 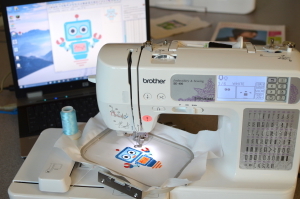 The Brother SE400 is a convertible sewing machine that can also automatically embroider graphics like emblems and text into a 4×4 size frame. They are fairly simple to use, with a touch screen and good directions, and about as reliable as a typical sewing machine when operated properly. We like to tell participants that some of the first automated computational machines were actually punch-card driven looms, which were often operated by women (some of the first programmers!). The tool offers additional social benefits, too, such as introducing young audiences to crafts familiar to older learners, as well as challenging traditional subject content for the medium (i.e. embroidering the BB8 droid from Star Wars instead of a flower). Cost: These machines can get pretty expensive, but go on sale with some frequency. Look for postings around $300, sometimes refurbished models can be found on Ebay for $275. We suggest avoiding used machines, as trouble-shooting complex mechanical problems that arise from unknown misuse is very difficult. Suggested Software: There is no good FOSS software for digital embroidery that we’ve found. SophieSew allows you to manually trace images one node at a time or use existing stitch files. We think it’s best to make use of SewArt, which supports many stitch patterns, file types and simple editing tools, and can be purchased for 2 computers at $75. Beware that this program does not have support for volume licensing and management. Materials/Parts: Felt and canvas make for good inexpensive materials to embroider without stabilizer for patches. Iron-on stabilizer can be helpful for work with clothing. Embroidery thread will look much nicer than regular thread, and a large spool of white can serve as material for winding bobbins. Eventually embroidery hoops will break and need to be replaced ($20 on Ebay), and needles snap on a fairly frequent basis. Make sure participants using the machine carefully use the button to lower and raise the needle for the auto-threader, we’ve observed the lever handle breaks off easily if thrust too hard. The warranty is a bit of a deception, as it can only be supported by certified repair agents, which in our state are four hours away and charge for shipping. Alternatives: This is really among the cheapest Embroidery machines on the market. We spent some time with older model initially, but it only supported a difficult computer-to-memory-card process and continually suffered from mechanical failures. The Brother PE770 work as a step up, as it is a very similar machine in terms of capability and process, but it features a 5×7 hoop size. The world of low-cost small-scale 3D printing has exploded in recent years, acting as a motivational curiosity for many new makers as well as impetus behind new easy 3D design software programs. 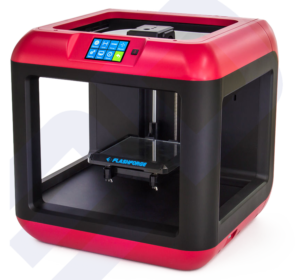 While we see a great deal of value in the process of building your own 3D printer (which ensures you know how to fix it!) as well as large-scale modifiable open source builds like the Lulzbot TAZ we’ve generally found it’s the tool most likely to break down and have problems. As such we’ve learned to rely on a model that is low-cost, makes excellent quality prints and support structure and, above all, is reliable and doesn’t really need maintenance. The build profile for our chosen FlashForge Finder is only 5.5 cubic inches but it prints well with PLA plastic, which is biodegradable and no more dangerous than cooking fumes. Typically our workshops and library activity sessions cannot last very long, so it makes a lot of sense to have a smaller printer, as you wouldn’t have the time or ability to leave the machine on all night printing something large. Cost: Typically around $300 on Amazon. Suggested Software: The FlashForge proprietary printing software is required for setting up prints and making minor modifications, such as resizing or stretching the height of a print. It automatically generates great support structure and only gives you some minimal access to settings, which is nice because it keeps it from getting too complicated. Generally we introduce learners to making in 3D via scanning (see next item), geometric 3D design with TinkerCAD (free) and organic 3D design with MeshMixer (free). Other software for more advanced users might include Fusion 360 (free for students), SketchUp (free) or Blender (open source). Materials/Parts: You’ll need to buy 1.75mm plastic filament as material for parts. These can be found for as little as $20 per 1kg roll all the way up to $50 or more for specialized biodegradable or extra-tough or flexible types. Don’t spend a ton of money on plastic, there’s honestly not that much difference between companies. We’ve also found that filament tangles are a frequent occurrence – probably the #1 machine-based (not user-error) cause of failed prints. Alternatives: Our favorite large-scale open source powerful 3D printer is the Lulzbot TAZ. You can make these into dual-extruder machines or even do things like attach a small dremel or laser. They have a strong support community and continually offer paths for upgrading. Best of all they’re huge and make for a great spectacle at events. Unfortunately they’ve very complicated and take an expert to maintain regularly to stay working. They have some free software options like Cura, which often don’t generate quality support structure. With educational discount large TAZ printers can be acquired for around $2300. You will need to occasionally replace a broken glass bed ($80) and extruders ($90). The real cost is the person to provide regular maintenance, however. 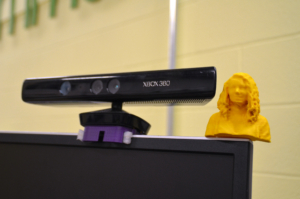 By far and above the cheapest 3D scanner available, the xBox Kinect is an old but simple game device that can use special software and alternative drivers to make scans. The simple meshes they make are actually a benefit, because it means you don’t need a very powerful computer to work with the resulting file. Generally they do require a desktop or laptop with a discrete graphics card to run a smooth scan, however. The most appropriate way to use them is to capture scans of people-size objects or scenes. A person can spin slowly around in front of it to get a scan of about half of their body in the one cubic meter capture area. Cost: Generally they’re available for around $20 on Ebay, plus a $8 USB power adapter. Suggested Software: The non-commercial version of Reconstructme is now free, and does an excellent job. We’ve found that the old API version is a bit faster, but was not able to capture color – and the new version is able to work with recent versions of Windows and graphics cards/drivers. We suggest using the scanner in an environment without too many complicated objects in the background. Another similar-costing (but simpler workflow) software option is Skanect ($130). Once a scan is on your computer it can be cleaned up with the trial version of Netfabb, shearing off unnecessary parts and repairing holes. Meshmixer also works well for modification and repair. Materials/Parts: We’ve had a couple of cheap power adapters die, but no Kinects themselves. Obviously you’ll need a 3D printer and filament to make prints. USB extension cables are helpful if you want to walk around a large subject (or group of people). Alternatives: The Kinect 2 can be found on Ebay for around $60 and paired with a USB adapter for another $50. This version can capture significantly better scans using the Microsoft SDK (try Kinect Fusion WFP) but requires a powerful computer. Going the other direction you can use photo-seaming methods with photogrammetry to turn your cell phone or tablet into a kind of 3D scanner. This requires a lot of practice and more post-processing work, but can be a great way to get quality texture meshes. Look into Scann3D or Trnio. iPad-based scanners like iSense or Structure sensors are great, but come with hidden software costs and still often require a computer with powerful graphics. One of the more exciting areas of rapid prototyping is in the world of electronics. Computers continue to shrink, increase in power and drop in cost over time and there are many small, dedicated microcontrollers that can be used for specialized tasks and inventions. Our favorite is the Arduino, largely because it is so widely known and supported. There are thousands of accessories and add-ons, as well as a wealth of knowledge databases (and free code!) online and it’s easy to get started quickly. Participants don’t need to know how to use Linux or complicated programming languages and they’re low-cost enough that they can be replaced easily when burned out or lost. They have an easily expandable pin-set to allow for layers (shields) to be added that can enable new functionalities, such as speakers, motors, GPS, data storage and more. They can also work for “internet of things” inventions, where sensors might collect data about an environment or system and then aggregate and display it online to help people make better decisions or enable new services. There are many Arduino derivatives, including larger varieties for increased control or memory, as well as versions like Gemmas that are specialized for e-textiles functions, allowing for metal snaps and conductive thread connection. We’ve had luck powering all kinds of maker projects with Arduinos, including robots, dancing pom-pom servo characters and flashing light displays. Cost: A standard official Arduino costs about $25, but since the design is open source there are R3 Uno knock-offs that can cost around $8 on Ebay, or CH340-based chips that require drivers but cost only around $4. Suggested Software: The Arduino software is free and open source and runs on all platforms. Most add-on boards have easily-available repositories as well. Materials/Parts: Arduinos will require additional equipment to get started, including mini breadboards, jumper wires, alligator clips, battery or AC power adapters, LED’s, LCD displays, sensors of all kinds, motors or servos and a multi-meter. 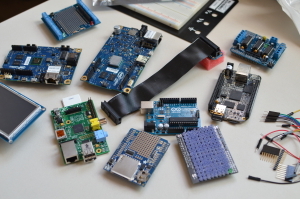 Alternatives: Other makers have found similar successes with more complicated small electronics platforms, such as Raspberry Pi or the Photon board. These systems have similar accessories but they also scale with cost. Some of them are capable enough to act like full computers, running operating systems and broadcasting to discrete displays. Littlebits are an excellent (but highly-expensive!) alternative for younger (k-5) children. Soldering is one of the essential supporting elements for small electronics (those DIY kits often come disassembled), but can also be a worthy stand-alone activity. We’ve had luck connecting LED’s to copper tape or soldering together simply blinky-badge circuits. 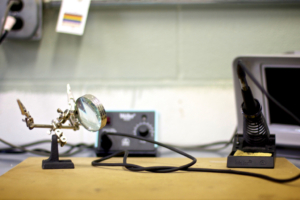 De-soldering can also be a good learning exercise, as learners may want to re-purpose components from old electronics or explore their construction. Cost: The good old-fashioned WLC-100 stations can be found for around $40 each, which are durable and hot enough to be useful for many tasks. Don’t buy just the “wand only” type systems – having a sponge and a place to rest it is not just convenient but also safer. Materials/Parts: Obviously you’ll need solder to actually connect electronics components, we suggest something that’s lightweight and split rosin/tin core. Soldering iron trips will need to be replaced on a regular basis, and it’s also helpful to have cleaner brushes, helping hands with magnification, and, importantly, small portable carbon filter exhaust systems to whisk hazardous fumes away. Flux might also be useful, depending on your application. Alternatives: Bigger fully-featured soldering systems are of course available. Systems with attached heat guns can make it easier to desolder and deconstruct electronics, and some come with built-in power supplies, voltage testers or carbon filtration. There are also just tougher, hotter Wellers out there too. Digital media production is often directly connected to digital making and rapid fabrication. Many learners have been drawing since they were very young, and transferring the ability to sketch with pencil and paper to digital mediums can be more natural (they respond to pressure sensitivity) and often interesting. We’ve had success using graphic drawing tablets to make patterns and designs with a wide range of audiences. Additionally this medium works well with animation techniques. 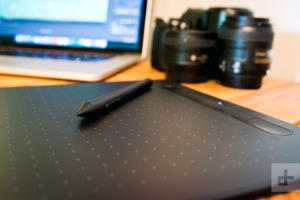 Cost: Wacom tablets have dropped in price over the past few years – they can be found for a reasonable $60-70 on Amazon and elsewhere. Suggested Software: There’s a wide range of art software out there. Some of our favorites are Adobe Illustrator, Photoshop and PaintTools SAI ($50) as well as open source options like Fire Alpaca and Gimp. Sadly Inkscape doesn’t seem to have good support for many tablets. Materials/Parts: It’s very easy to lose a stylus (they look like pens) and they also sometimes break. Expect to buy some replacements, which are often $15 each or more. Alternatives: Avoid the knock-off Turcom versions, they have very poor driver support. If you’re just using Adobe Illustrator or Autodesk Sketchbook on Windows they might work okay for you. Obviously the more you’re willing the spend the more capabilities you can add to your Fab Lab. Some of the most important are CNC-based systems for cutting and milling. This includes laser engravers (we like Epilog and Universal Systems), routers (Shapeokos and MPCNC are inexpensive and open-source, but require expensive software to do true 3D) and circuit board milling machines (MDX-20 is the Fab Lab spec machine, there are newer alternatives). Just about every day there seems to be a new DIY low-cost version of these systems released, like the Wazer water-jet cutter system, which costs about 1/10th what equivalent industrial systems might. It’s also helpful to have 3D filament recycling and extrusion systems as well as vacuum formers for shape-casting. Check out our tool list to see some of what we employ. Suggested Software: We’ve just outlined some preliminary software here. If you have the budget for it (or, in our case, a University license system) check out companies like Adobe and Autodesk, who offer a wide array of maker-based software. Materials/Parts: It may go without mentioning but there are obviously many supporting components for the systems outlined above, including furniture like rolling tables and chairs, utilities like multi-power power strips or sinks and the ever-essential broadband internet to find and share innovations. For the cost of a single official MIT Fab Lab specification machine you can make a mini Fab Lab for a class of 10 simultaneous learners (more in groups). Obviously the balances could be changed, but remember it’s important to have a wide variety of tools to enable composite projects. For example, cutting out textiles production equipment would make it much harder to make wearable Internet of Things devices. Though the Fab Lab has many ground breaking sets of curriculum and prototyping techniques (see our summer camps!) our documentation isn’t organized enough to be presented online… yet. Most of our training occurs in-person. For now, we have a preliminary Google Docs Curriculum Index for teachers as well as a gateway for tutorials and YouTube how-to’s. We plan to expand this as part of future grant initiatives.